We believe that the time has now come for a change in the modern International 6 Metre. That is why Juan Kouyoumdjian, yacht designer, was commissioned to develop a modern 6mJI. This new design is not to be based in any way whatsoever on previous developments but to truly be a totally new design and creation. Juan Kouyoumdjian is one of the top yacht designers in the world and is completely free of any "baggage" from the metre classes, increasing the opportunity for the creation of something new. Juan designed the two ABN AMRO boats competing in the Volvo Ocean Race and is co-designing the BMW-ORACLE boats for the next America's Cup. The visits to his office in Valencia also gave us an idea of the state-of-the-art computer aids he has at his disposal in his office. Incidentally, intensive discussions on the optimum deck layout have taken place between our team and his personnel. Guy-Roland Perrin, as Chief Measurer, is also involved in the project. After all, the new yacht will have to comply with the Measurement and Rating Rules. Our aim is to present this project to you in ISMA Bulletin #1 2006. We have just started the detailed project which should be available in Autumn this year. The task in Winter 2006 will be to enquire about shipyard facilities. Our objective is to be sailing the new 6 metre by no later than 2008 and consequently to participate in the 2009 World Championships in Newport, Rhode Island. It was with great pleasure that I received this proposal from Beat Furrer to participate in the development of a new generation 6mJI boat. There are two important facts regarding this new development. The first one is related to the very constraining characteristic of the 6-metre class rule; in which the metric formula is limited by additional rules. The second relates to the fact that as a traditional rule, the designs have been refined over the years to a very competitive level, calling for the use of the newest technologies, especially to further develop the hydrodynamic characteristics. It is important to note that any design optimisation needs to be made considering the conditions (wind and wave) into which the boat is going to sail. The 6-metre rule forces a trade-off between different parameters. Assuming that the freeboard and girth difference are kept constant the main trade-off is between the length, and its consequent displacement, and the measured sail area. This trade-off has a further complication in that two boats with identical measured sail area might have different real sail areas. 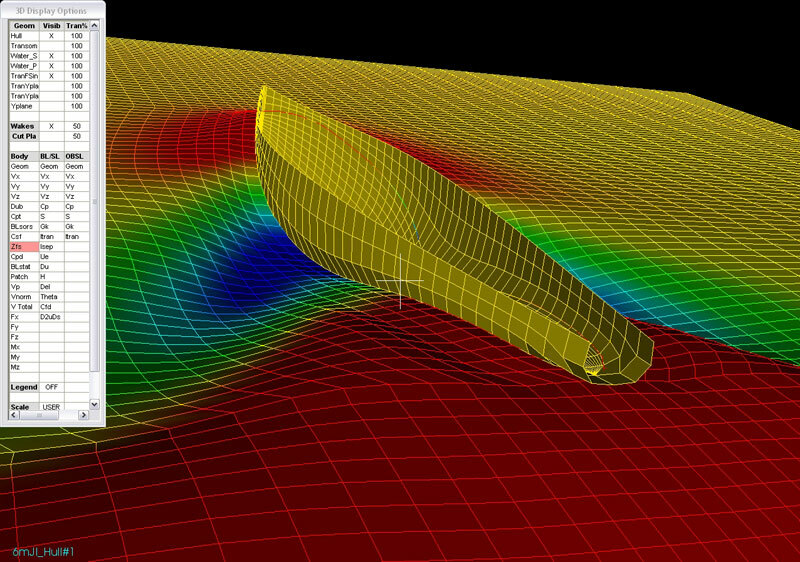 Taking into consideration this complication the best way to compare the alternatives is using a velocity prediction program (VPP) to account for not only the hydrodynamic differences of the hulls but also the aerodynamic characteristics in sailing conditions. The VPP shall reveal whether the increased sail area of lower displacement boats pays more than the wave drag penalty of shorter waterline length and reduced stability, or vice versa. And in this process find the optimal. The research areas in the program included not only the hydrodynamic part of hull and appendages but also the rig, sailplan and the deck layout. The image above shows the wave height for one of these runs; it can clearly be seen the steep wave elevations and troughs characteristic of all metric classes. This pronounced wave pattern increases the wave drag component caused by the canoe body shape forced by some of the rule constraints. In terms of hull then the objective is to minimize wave formation in upright and heeled conditions. A similar process was carried out to find the optimal appendage configuration for the selected hull candidate. Three different configurations were tested. For the appendages the focus was aimed at reducing induced drag due to the draft limitations imposed by the rules while achieving good manoeuverability. The sailplan has also an important effect on performance since it is the engine of the boat and was in consequence carefully analysed. As with the case of the hulls, there are some trade-offs imposed by the rule that were evaluated in order to get the optimal sailplan for the selected hull. The parameters into play in this case were the sail areas, mast position, mast rake, position of the sailset's centre of effort, and sail trimming; for the sails areas the scope was not only to maximize sailset areas but also to improve the area distribution in terms of aspect ratio and increasing roach area. The rig was also optimised considering the rule limits; namely the number of spreaders. An interesting development would be the use of a mast made of composite materials in order to play with fibre orientation to achieve the desired twist; this could also reduce mast weight. The isotropic characteristic of aluminium does not provide this possibility. Finally but very important is the deck layout. Normally the layout is based on the skipper preferences; although it is important that the helmsman and crew feel comfortable with the layout, it must respect certain guidelines aimed at improving performance. These guidelines are intended to achieve the optimal weight distribution. Unfortunately the tight limit imposed by the rule for the cockpit areas complicates any aims to move the weight as much aft as possible. The ideal weight distribution locates three crew members aft of the helmsman as can be seen on the picture. The skippers might feel uncomfortable with this layout so an intermediate approach with only the main trimmer aft of the helmsman is also presented. This case represents the configuration with the crew weight as aft as possible but keeping the genoa trimmers forward of the skipper. It is important to note that this last version has a worse weight distribution and is not the optimal for the actual balance of the boat according to the mast and rudder locations. Another feature presented is a closed cockpit in order to avoid water entering into the hull and to have watertight compartments. This is combined with a cockpit-stepped mast for easy regulation of the mast base position from the cockpit. In order to meet the cockpit area limit imposed by the rule it is necessary to install a removable deck cover. The space under the cover is used to keep the spinnaker. This closed cockpit calls for a hatch big enough to gain easy access to the interior of the boat. Two wings have been included to install genoa rails on them and reach the optimum angle without having to reduce the genoa area or increasing the beam of the hull which would worsen the performance. In conclusion we can say that given the actual development of the class over its large history it is possible to further optimise the hull shape. This optimisation shall be accompanied with the corresponding optimisation of the appendages, sailplan and deck layout. In this process the conditions (wind and waves) under which the boats are going to sail must be considered.